There’s a [Wine] App for That! Happy New Year! I’ve just finished reading final papers from The Idea of Wine class I teach at the University of Puget Sound. This semester several students probed the intersecting worlds of wine and technology. Here, for your consideration, are quick summaries of five papers that explore variations on this very contemporary theme. Anna wrote about wine Apps. Apps are creatures of the 21st century — application programs that run on smart phones, iPads and similar electronic devices. There are thousands of Apps (the iTunes App Store and Android Market are full of them) and so it is no surprise that there are wine Apps, too. Anna discovered five basic types of Apps, which she classified as wine journals, wine glossaries, wine-food pairing programs, electronic sommeliers that provide recommendations from lists of wines and wine quizzes and games. SmartCellar is an example of a sommelier-type App — restaurants can use SmartCellar-equipped iPads instead of printed wine lists to help their guests make well-informed wine choices. Project Genome, a Constellation Brands study, identified six distinctive groups of wine buyers ranging from Overwhelmed to Enthusiast. Anna matched wine Apps with buyer profiles and concluded that there is something for everyone. But are any of them perfect? No. Anna imaged the perfect wine App for her — given her particular interest in wine today. No single existing App would satisfy all her needs, she concluded, but there soon will be given the pace at which new Apps appear. QR — the New Face of Wine? Jack wrote abut QR (Quick Response) codes. QR codes work on the same principle as Universal Product Codes, but whereas UPC codes can store 12 characters of information, QR codes hold much more. You scan a QR using an App on your smart phone and the App uses the embedded information to direct its display. QR codes are everywhere these days, especially in advertisements. Jack reports that some new graves in Japan feature QR codes that, when scanned, show photos of the deceased. QR codes at Japanese tourist sites provide detailed visitor information. Jack found several applications of QR codes to wine, but he thought that the potential of this technology is not yet fully exploited. QR codes in advertisements or wine labels are a way to give the consumer more information. More advanced technology — already in use in other consumer goods markets — would allow QR Apps to connect with local retailers or to interface with online communities like CellarTracker. “The more you think about it, the more it’s clear that QR codes have the potential to change everything about wine shopping,” Jack concluded. “They are free, easy to make and will soon have an army of smartphone users” to exploit them. Japan has been using them for 16 years, he said. Time for wine makers and buyers in the U.S. to catch up. Alyssa and David wrote very different papers about wine and social media. Social media refers to electronic communities that link people in flexible arrangements and allow them to interact and to share information of various sorts. Alyssa examined Facebook, Twitter and the blogosphere to find the potential of each to forge durable wine-based interest groups. David’s paper explored the role of the Internet (and social media) in building or sustaining consumer communities using a very creative approach — comparing wine with beer. Beer has long been marketed as a group thing — a bunch of people get together and have a good time over a few beers. Wine’s marketing is not as consistently focused, David asserted, and the community element not so clearly developed. Finally, Ben’s paper looked for linkages between Northern California’s two famous valleys. Not Napa and Sonoma (although that would be an interesting paper) but Napa and Silicon. What can we learn about wine, Ben asked, by looking at microchips? Quite a lot, he discovered. Ben compared Annalee Saxenian’s account of the development of Silicon Valley in her book Regional Advantage: Culture and Competition in Silicon Valley and Route 128 with James Lapsley’s history of the Napa Valley wine industry, Bottled Poetry: Napa Winemaking from Prohibition to the Modern Era. He found rather interesting parallels between the two seemingly separate spheres of California life and concluded that Saxenian’s model of high tech regional development explains Napa’s evolution very well. Sorry, I cannot distribute these papers directly, but if you are interested I will try to connect you with the student authors. I know that it is not easy to make good wine. And wine can be difficult to sell, too. But apparently buying wine is even harder. At least that’s the word from some top wine critics. Lettie Teague’s column in this weekend’s Wall Street Journal was ostensibly about that 1970s favorite, Pouilly-Fuissé, but much of it was actually a gentle rant about the difficulty she experienced in trying to buy a few bottles for a tasting. Seems the specialist wine merchants she contacted just didn’t have much in stock. She had to work pretty hard to put together a reasonable sample. Is it just a Pouilly-Fuissé problem? Maybe, but Teague reported much the same experience a couple of weeks ago when she tried to put together a tasting of wines from Washington state. Teague’s merchants carried just a bottle or two of Washington wine, same as that 70’s wine. That’s all we need, they told her. No one cares, they said. I know there are many factors at work here including New York’s peculiar retail wine regulations, the dollar-euro exchange rate and especially the recent “flight to safety” among wine sellers who seek to minimize inventory in a very uncertain market. America’s byzantine interstate wine trade regulations are part of the problem, too. I’ve often looked across the pond to Britain and imagined how great it would be to have a unified wine market (without dozens of state and even local regulatory regimes). Wine is easier to sell in Britain because of this and so I’ve always thought that it was easier to buy, too. I guess I forgot my own frustrated wine buying experiences living in London a few years ago, when I tried to find interesting U.S. wines to share with British friends; pretty much all I could find in my local drinks shop was bottom shelf generics. I was reminded of this by one of Jancis Robinson’s recent Financial Times columns where she vented her frustration about trying to buy just a bottle or two of very good wine for dinner. You can buy vast quantities of cheap and cheerful wine as Tesco, she said, and of course you can purchase many of the finest wines on earth by the case and have it delivered to your door the next day. But what if you just want one bottle of something a notch or two above the supermarket category? Yes, you can do it, she said, but it isn’t easy. And then she listed the five British merchants that she thinks fill the bill. Five! Ouch. “… this list is just about it – in a country of 33.4m wine drinkers,” she moaned. The gap between BOGOF Tesco and a case of Chateau Lafite is bigger than I thought! Robinson cites the increasing dominance of the big supermarket chains as a critical factor driving the specialist wine merchant out of business. Tesco, of course, is now the world’s largest wine merchant and 70% of British wine comes from a supermarket shelf. Decanter published an article last year (in the 2009 California supplement) bemoaning the fact that so few American wines are available in the UK. Bottom and top are easy enough to find, but nothing much in the vast middle. They cited a number of factors including American winemakers’ resistance to the deep discounts needed to make export sales, high British retail margins and the incompatibility of American wine styles and British palates. Whatever the reason, it seems that British wine buyers are surprisingly under-served when it comes to America’s diverse wine array. Why Can’t a Wine Be More Like a Book? It occurs to me that the situation facing wine buyers today is a lot like book buying was twenty years ago. It was easy to find best sellers and trashy paperbacks. And specialist shops catered to particular interests at a price. But much of the vast book supply was very difficult for buyers to access. And then came Amazon.com, of course. And now the world of new and used books is only a click away. Wouldn’t it be great if there were an Amazon.com for wine? That would be one “killer app,” as they say. But I don’t think it is going to happen, at least not soon. 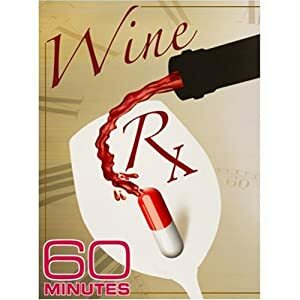 Amazon.com announced plans to start selling wines online a couple of years ago, but nothing seems to have come of it and it is easy to see why. Although bottled wine does share many of the attributes that made books Amazon.com’s initial target market, there are a number of discouraging negatives to consider. Wine is heavy and costly to ship compared to books. A books doesn’t care if the weather is hot or cold while it is in transit, but your half-case of Chianti surely does. And of course there are the legal barriers that restrict interstate shipping at every turn. I’m hoping that someone will come along with that Killer Wine App that makes fine wine buying as efficient as shopping for books, but until then I think that retail [wine] therapy will remain a source of frustration, not relief, for at least some of us. Jancis Robinson’s column in Saturday’s Financial Times suggests that wine books share some of the same distribution frustrations as wine. She reports a trend towards self-publication of specialist wine books. Who Sells the Most Wine? Who is the #1 retailer in the wine world? The answer is Tesco, the British-based supermarket company. Tesco sells more than 320 million bottles of wine each year in Britain alone (one of four bottles in this important market). It is a wine selling machine, using every available mechanism to market wine and build the brand. Tesco stores feature attractive Wine Walls, for example, tailored according to the demographics of individual stores. Wine displays are strategically positioned near the fish, meat and cheese counters as you will appreciate from your own experience. Wine tastings and wine-related events are organized by the no-fee Tesco Wine Club, which boasts hundreds of thousands of members. Tesco takes the everywhere seriously, so their quest to sell wine doesn’t stop whey you leave the store. Internet wine sales are an important retail vector in Britain since nation-wide shipping and delivery is not a problem as it is in the United States, where jurisdictional issues complicate every aspect of interstate wine sales. The Tesco Wine by the Case website provides consumers with a rather stunning array of wine selections that range from a heavily discounted mixed case of “mellow reds” for £28 to a Vosne Romanee Domaine Hidelot Noellat 2006 Red Burgundy for about the same price, but for just one bottle. Tesco has captured about a quarter of all internet wine sales in Britain. Buyers earn Tesco ClubCard points both online and in the stores. The loyalty card system carefully tracks the purchases of each customer (and notes non-purchases, too, I suppose), providing data to guide store strategy and the opportunity to produce individualized checkout coupons to encourage wine drinkers to buy more or better wines or perhaps to try something different. Tesco was an early pioneer in loyalty cards and is thought to use this data very effectively. Tesco has goes to great lengths to reach British consumers whenever and wherever the urge to buy wine might hit them. Tesco and its UK competitors have established substantial wine stores in Calais, France just minutes from Hovercraft ferry and Eurostar train stations. British consumers have long crossed the English Channel in search of duty-free bargains and British duties still make the trip an attractive excursion for some. Wine can cost about 25 percent less in Tesco’s Calais store and online ordering makes stocking up quick and easy. Tesco’s latest (as of this writing) innovation is a smart phone app for wine lovers. Enjoying a nice bottle of Chianti at your favorite Italian restaurant? Want to know where to buy it? Well launch the app and use your phone to take a photo of the label on the bottle in front of you. High tech label recognition software will identify the wine, provide maker information and tasting notes and even search through the Tesco online inventory so that you can order a case right now for immediate delivery. Tesco and wine are with you anytime, anywhere. Tesco and the other British supermarkets use wine to make money and to change the way at least some British shoppers think about grocery stores and even how they think about themselves. In the process, of course, these retailers have acquired a certain amount of power. Indeed, Decanter’s 2009 “Power List” of the most influential people in the world of wine ranks Tesco’s wine director Dan Jago at number six – a few places behind Robert Sands, head of the world’s largest wine company, Constellation Brands, and wine critic Robert Parker but ahead of French President Nicholas Sarkozy and E&J Gallo President Joseph Gallo. This power is put to a surprising number of uses. That Tesco would use its market muscle to reduced wine costs in not unexpected. Volume purchasing has always been an excuse to press for lower prices. Tesco goes further, however. The New World wines in the Tesco lineup are shipped to Britain in bulk, is 20-foot shipping containers that contain giant plastic bladders holding thousands of liters of wine. The bulk wine is bottled once it reaches Britain, eliminating the cost of hauling fragile bottles half way around the world. Tesco has even started moving the bulk wine to its bottling plant using Britain’s historic system of canals, saving the expense of tanker truck shipment and lower the wine’s carbon footprint. 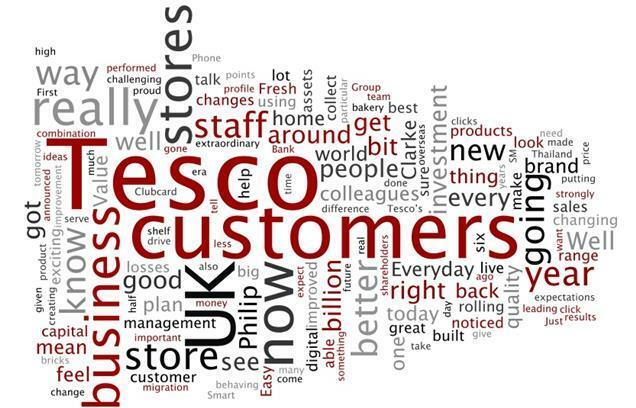 Tesco is very focused on innovation and uses its power to achieve it. Tesco has pressed its suppliers to switch from cork closures to screw caps, for example, in order to eliminate the three to five percent loss that is commonly experienced due to TCA cork taint. Anyone who wants to get wines into the Tesco pipe had better not show up with a corkscrew (iconic brands excepted, of course). Recently, Tesco has introduced the world’s lightest wine bottle in an attempt to further reduce production and shipping costs and reduce environmental impacts. The new 300g bottles are 30 percent lighter than Tesco’s previous lightweight bottle and much lighter, of course, than some of the heavyweight containers that one sometimes finds on the Wine Wall. Structural concerns require that the new bottle have a new shape – somewhere between the high shoulders of the classic Bordeaux and the soft silhouette of a Syrah or Burgundy. Tesco estimates that use of this special bottle will have 560 metric tons of glass that it uses to bottle the more than 10 million liters of wine that it imports each year and sells under its own label. You don’t think of supermarkets as being especially innovative, but it is pretty clear that Tesco is using its market power to encourage innovation in the world of wine. Whether or not you shop at Tesco (or at its U.S. arm — the Fresh & Easy Neighborhood Markets in the American southwest) you are probably affected its activist wine policies. Here’s a simplified version of the sub-prime mortgage crisis narrative. A housing bubble masked the inherent risk of the mortgaged-backed securities that financed the bubble itself. Investors were unable to fully assess risk because the complicated financial vehicles were not very “transparent” and the rating agencies did not prove to be trustworthy guides. When the crisis came, liquidity dried up and the market deflated (crashing in some cases). The solution to the problem, many think, is to increase transparency — to make it easier to figure what is in a mortgage-backed security and how to assess its risk and return. Some wine buyers will find it easy to relate to elements of this story, according to the Project Genome study recently released by Constellation Brands (I have written about Project Genome in my post “What are wine enthusiasts looking for?”). According to this study, the largest single group of wine consumers are”overwhelmed” by the choices confronting them and cannot adequately assess the risk they face when staring down a crowded supermarket wine aisle or endless restaurant wine list. Their “liquidity crisis” is a real one — they are afraid to invest in complicated wine products due to a lack of confidence in their knowledge and lack of transparency regarding what’s really in the bottle. Intimidated, they buy a lot less wine than other groups. They lose and winemakers lose, too. Project Genome estimates that overwhelmed consumers represent 23% of wine buyers, but make just 13% of all wine purchases. They are the “bottom of the pyramid” of wine and many industry people figure that a fortune awaits anyone who taps this market. So what’s the best way to make the wine buying process more transparent and end the overwhelmed consumer’s liquidity crisis? Better information is one approach. Wine critics are the bond rating agencies of the wine market. Their scores give many wine buyers the confidence they need to make what really is a risky purchase. At their best, wine critics serve a useful function of reducing uncertainty about what’s in that bottle and whether it is worth the price. But there are dozens of wine critics and their ratings, using different scales and ranking protocols, do not always agree and are not always a clear guide. How many disappointing wines have you bought because of the “89-point” rating on the shelf tag? 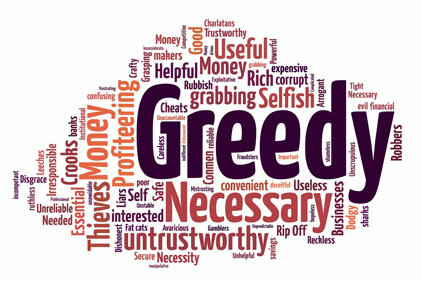 It only takes a few highly-rated losers to discourage an overwhelmed buyer from taking a chance. Wine critics are part of the answer, but they are also part of the problem. What other options are available? The May 15, 2008 Wall Street Journal included an interesting article by Charles Passy (the “Cranky Consumer” columnist) that examined how some wine retailers are trying to demystify wine. “For Novice Shoppers, a Little Wine 101” describes four retailers, WineStyles, Total Wine & More, The Grape and Costco, and their different marketing strategies (I wrote about Costco’s system in an earlier post, “Costco and Global Wine“). I’ve been to a WineStyles store so I can give a personal report. The store is arranged according to wine style profiles (crisp, silky, rich, etc.) rather than varietal type, production region or retail price. So if you know you like a crisp wine, you go to that wine rack and you find wines such as Washington Riesling, Chilean Sauvignon Blanc and South African Chenin Blanc. You are directed to the style you like and hopefully encouraged to try unfamiliar types of wine. If consumers can actually figure out what they like about wine and if they develop confidence in the style categories, this system helps them make better and more self-assured choices. The chicken wine is “Predominantly Garnacha” according to the label — not a wine that an overwhelmed consumer would probably risk as a varietal choice, but might try and like in this format. The salmon wine is a Pinot Grigio/Garganega/Chardonnay blend. I like this concept because it links wine to food, which is very important, and encourages experimentation. It will be interesting to see if buyers embrace it or if it is just a novelty that soon fades. Great Britian is the most important wine market in the world in part because British retailers have developed a number of successful strategies to increase wine buyer confidence. Supermarkets are the big players in the U.K, and house brands are key to their wine strategies. Tesco, Waitrose, Sainsbury’s and Marks & Spencer all have their own brands of wine (sourced from around the world). Buyers are willing to try an unfamiliar wine because their confidence in the supermarket chain transfers over the the wine. Trader Joe’s uses this strategy here in the U.S. (I have written about this in 300 Million Bottles of Two Buck Chuck). Trader Joe’s sells vast quantities of Charles Shaw (a.k.a. Two Buck Chuck) wine each year and the key is reputation. Not the wine’s reputation — the store’s. Trader Joe’s has a reputation for value and quality, which lends credibility to their house brand wine. As I have said before, the miracle of Two Buck Chuck isn’t that you can sell a wine for $1.99, it is that you can get anyone to buy it. The $1.99 price point just screams “rotgut.” But people happily buy wine at Trader Joe’s at price points they would never think of considering at Safeway or Kroger because they have confidence in the TJ brand. My local upscale grocer, Metropolitan Market, is trying the house brand route, apparently with success. 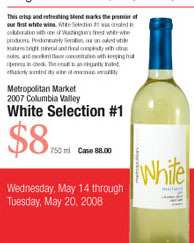 For the last year or so they have occasionally stocked limited-release house brand wine specials such as the 2007 Columbia Valley “White Selection #1” shown here. The wines go for $8 per bottle or $88 per case and they are stacked in big displays that remind me of, well, Trader Joe’s. These house brand wines are kind of interesting. The first release of the year was a Rosé — hardly an easy sale given upmarket consumer resistance to pink wines (too close to White Zin!) and the chilly spring we have had — and now a white that turns out on close inspection to be an oak-free Semillon blend. I like Semillon quite a bit, but I don’t think you could sell it by the case at a neighborhood grocery store with a traditional brand name and varietal label. But “Met Market White #1” and the Rosé are products that buyers seem to embrace as safe bets and good values because of the store’s reputation for quality. They fly out the door, according to the satisfied customers in line with me last week. You might have trouble selling them as ordinary branded varietals, but they go down easy as trusted house brand wines. The British know the wine game really well. We are smart to learn from them. Take a close look at your supermarket wine aisle and I think you will see a lot of products designed to make wine easier to understand and buy. With so much creative energy at work here, I am confident that the needs of overwhelmed wine buyer market are being well served. Maybe they’ll stop being overwhelmed and their liquidity crisis will end. I wish I had the same confidence about the financial markets!